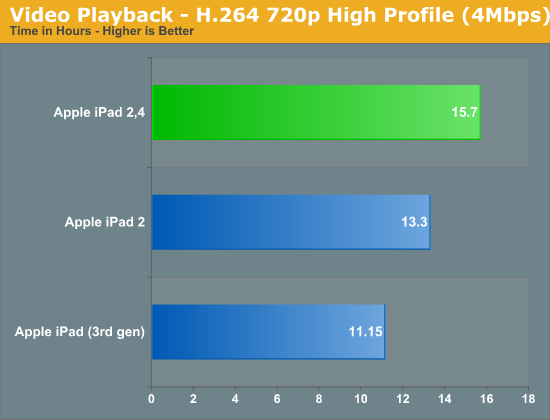 "Note that idle power is actually higher than video playback simply because there's more that's being driven on the display, at a higher intensity on the iOS home screen than on a dark 16:9 video." That really doesn't make sense. This is LCD, not OLED. Displaying black/white should take about the same amount of power, because the backlight is uniform and covers the whole display. It doesn't turn off on dark areas of the screen. No need to call shenanigans. You simply failed to read what was written. He is clearly talking about screen content, when he mentions "dark 16:9 video" which implies that power changes drastically dependent on what is displayed. This is true for OLED screens, but untrue for LCD screens. Also while dedicated Video decode HW offloads work from CPU/GPU, they essentially have no work to offload while idle. Really great dedicated Video decode HW could get you to idle consumption, but I don't see how it could get you below idle. 1) It is possible to have a small reduction in LCD power consumption by displaying black vs. white. The gap isn't anywhere near as dramatic as it can be on an OLED display, but it can be measurable. This alone can't explain the difference, I agree. 2) It's possible that Apple is putting the SoC into an even lower power state when a video playback scenario is triggered. 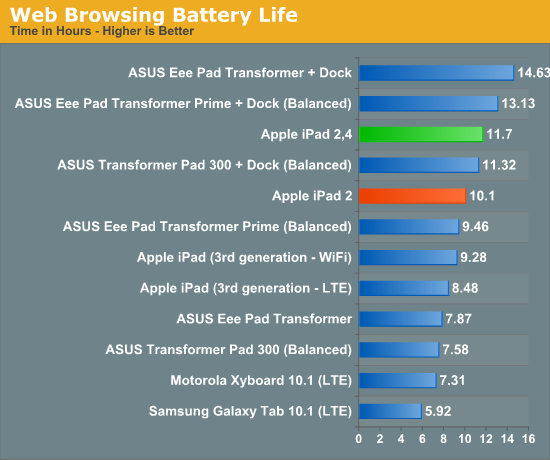 Apple does quite a bit of aggressive power management so this wouldn't be too far fetched. 3) It's not clear to me if Apple is doing any localized dimming, which would have a significant impact on video decode power consumption. I think the back-light as the largest power draw (especially in idle), is the easiest source of savings. 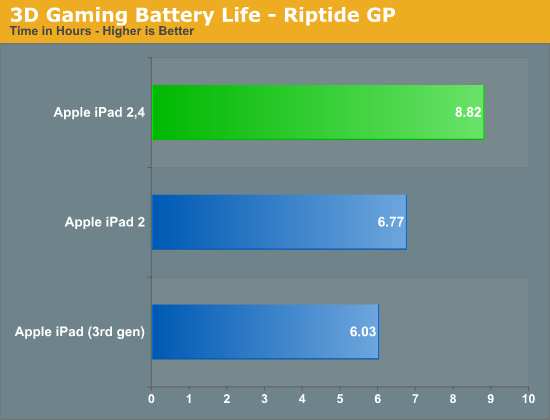 Displaymate measured 7watts at max for the back-light alone on iPad 3 ! Easy reductions either from a simple general brightness reduction when a movie is playing, or dynamic backlight control while a movie is playing. Done right it gets some savings while being hard to notice. I really don't think you can get a much lower power state while playing video, than while just displaying a start screen. In either case the CPU is still running, still instantly ready for touch, or sensor reactions. "This particular iPad 2,4 sample came from Best Buy, and several attempts to find one elsewhere came up short. 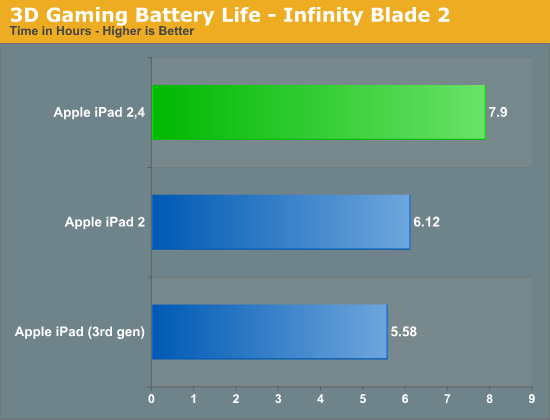 All indications seem to point to the iPad 2,4 being relatively rare, which makes sense considering what's inside it." The other tries were at an Apple store (3x) and a Walmart (1x).